Embroidered peasant tops are everywhere this Summer. I don’t need to tell you that embroidery is a big trend continuing on from a couple of seasons ago. These tops are a knod to the 70s whilst continuing on both trends. These gorgeous embroidered peasant tops are so lovely to wear on a warm day with shorts or with jeans (I love mom jeans in keeping with the loose fitting silhouette) the big sleeves make them so comfy. I wore this Next red peasant blouse during my trip to Barcelona and lots of my followers and friends all asked where it was from. 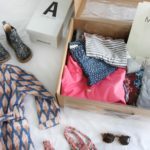 I think I’m one of the last bloggers to have posted it on Instagram in all honesty. It was very popular after some really big bloggers were seen wearing it very early on in the season. I was lucky to even get one as it was sold out online in my size! I was so happy to stumble across it in store. Anyway, it’s now sold out in a few sizes and isn’t coming back into stock in sizes XS and S. So UK size 8 – 10 and 10 – 12 and US size 4 – 6 and 8 – 10 aren’t available any longer. You can still get it in size M (wait time of 2 – 3 weeks), L is in stock and XL has a wait time of 1 – 2 weeks. What if you want one now? If you want one of these tops now before they sell out then keep scrolling, I’ve compiled a list of some alternatives embroidered peasant tops to the red Next one which are just as gorgeous and are in stock, but they won’t be for long. Still limited sizing at the moment, but you can order XS and S to arrive in a few weeks and if you’re not a fan of the red, the blue is perfect for you. Another one from Zara (there are a few), with the cords that tie in a corset-style criss-cross at the neckline. This one is a slightly different style as it contains lace and is really lovely in this soft white colour. This version combines two popular trends at the moment, embroidered peasant tops plus the blue and white candy cane stripes. Black embroidery means that the detail is very visible. Love it. I love this brand, although I can’t take credit for discovering them, I was introduced to them by Lisa from www.cityrunmum.com. Dodo Bor Or has such detail oriented pieces and they just ooze quality. I like how tasteful the embroidery on this blouse is, completely on trend without being too loud. Styled exactly as I wore it in Barcelona with cut off shorts, this is another great embroidered peasant top that includes some colour. This time from Anthropologie. Another one from Zara, super affordable and a toned down compared to some of the others. It features off-white embroidery on off-white cotton, the detail looks fab up-close. Probably the sought-after collection of embroidered peasant tops out there at the moment are those by designer Vita Kin. Her SS17 collection is filled with this embroidery detail, a bit on the pricey side of things, but gorgeous all the same. Take a look at the full collection here for other embroidered peasant tops and dresses. This is another special embroidered peasant top, again at the higher end of the market price-wise but can we all just take a moment to appreciate that intricate tapestry floral motifs on the sleeves – so gorgeous. It’s made of 100% linen and is hand-made in Ukraine. I love all the colour in this top, it is a bit light on the other details like the cords, but I think the colour and the contrasting black and white stripes more than makes up for this. This also comes in petite! I love the colours in this embroidered peasant blouse, It would be perfect on holiday, the light blue reminds me of the gorgeous water-shots of Santorini flooding Instagram during Summer. Again, this blouse has limited sizes, but it’s such a bargain, I thought I had to include it in the list. Also, so far many of the blouses featured have been in light fabrics, so this black one is for those of us that like to wear darker colours. 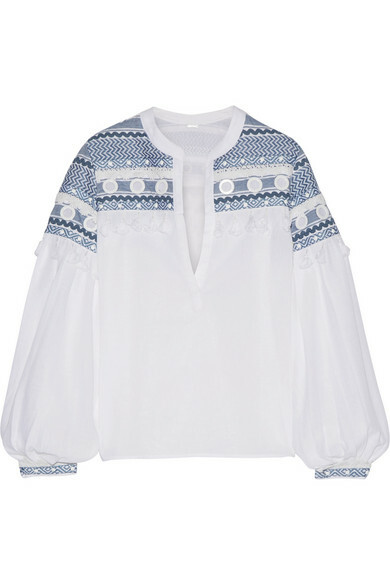 Do you already have an embroidered peasant blouse? How do you style it? Also share the link below so that we can find it!